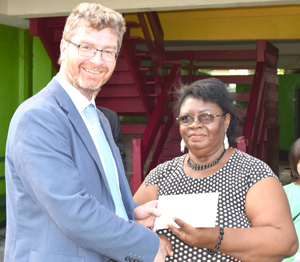 The British High Commission and Quantum Leap Security have collaborated to bring happiness to the residents of Joshua House Children’s Home. Yesterday the two entities showed up at the children’s home in Georgetown bearing gifts and monetary bestowal. Joshua House is located in Thomas Street, South Cummingsburg, Georgetown. A white sack with toys was sponsored by the British High Commission. Along with the recreational toys, the children were presented with colourful educational books to facilitate their learning. The books were contributed by Quantum Leap Security. Other contributors included Pizza Hut Guyana, Marriott Hotel, Palm Court, Roy Beepat from Gift Land Mall, Ameena Gafoor, Ricki and Bibi Ramsaroop and Lewis and Neeve Kartick. According to British High Commissioner, Gregg Quinn, the books and the money donated cost approximately US$1500 ($300,000 GYD). He said that Prince Harry is very fond of the children’s home since his visit there last year. As a means of raising funds for the presentation, the two donors hosted two cricket matches recently. The matches were played between the Diplomatic Community (representatives from the British High Commission, US Embassy, High Commission of India and United Nations Development Fund) and Quantum Leap Security. According to Administrator of the home, Gladys Accra, the Joshua House currently houses 48 children. She also said that the children’s home will be keeping a concert on December 23 in the compound. They are asking for the public to support the event.